It’s less than 20 years since Bruno Peyron’s 86ft catamaran ‘Explorer’ became the first yacht to break the psychologically significant milestone of 80 days for a non-stop round the world voyage. In doing so, Peyron became the first holder of the Jules Verne Trophy, with a circumnavigation time of 79 days 6 hours 15 minutes 56 seconds. It took a further nine years for the 70-day barrier to be broken, with Bruno completing the voyage in 64 days 8 hours 37 minutes 24 seconds on the 110ft giant catamaran ‘Orange’. Since then the time has tumbled as boats became ever larger, however, a measure of the challenge of this goal is that, of the 23 boats that have set out to break the record, more than half had to drop out due to damage and only eight have their names inscribed on the trophy. 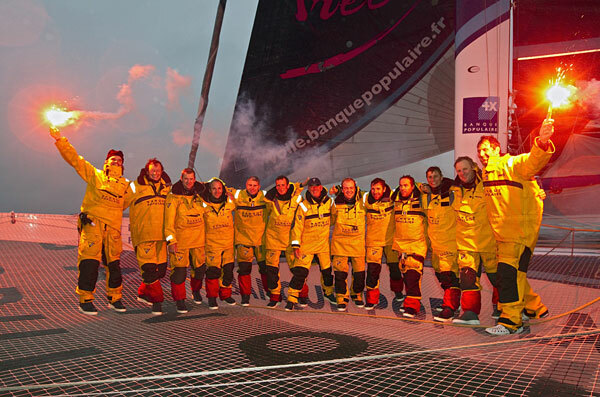 The most recent is Bruno’s younger brother Loick, whose 14-strong crew on the 130ft trimaran ‘Banque Populaire V’ blasted 29,000 miles round the planet in just 45 days 13 hours 42 minutes and 53 seconds – an average speed of 26.51 knots. To maintain that average, ‘Banque Populaire’ spent much of the time at speeds of 30-40 knots – downwind she sails at 1.6 times the true wind speed. A sling-shot start in late November off the island of Ushant in north-west France saw the team averaging a consistent 35 knots in the early stages of the voyage. Two days later they were 1,350 miles to the south, passing the island of La Palma in the Canaries. Other than the Kerguelen Islands, deep in the southern Indian Ocean, this was the only land they would see in the entire voyage. 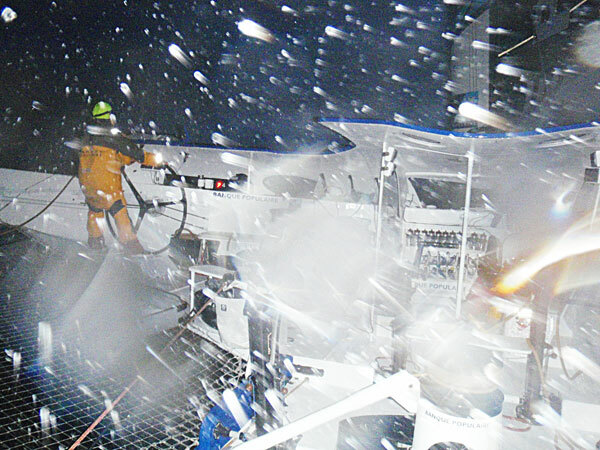 Ten days later they were off the southern-most point of Africa, Cape Aghulas, with a 2,000 mile lead on the reference time set two years earlier by Franck Cammas’ ‘Groupama 3’. This comfortable cushion allowed Peyron’s crew the luxury of avoiding temptation to push the boat to the maximum – for up to 75 per cent of the voyage they held back from full speed to minimise the risk of damaging the boat. The Indian Ocean was another super-fast leg – they spent four days sitting in the optimum part of a weather system as it sped across the southern latitudes and as a result ‘Banque Populaire’ was south of Australia’s Cape Leeuwin within an incredible 18 days of leaving France. However, the Southern Ocean was not all plain sailing – they had to route round an extensive ice field, rolling the headsail at night to reduce speed to 18-24 knots while the look outs used radar, night vision glasses and a Raymarine infra-red camera to spot chunks of ice. Then deep in the south, they experienced a period of calm, followed by easterly winds that further slowed progress. However, the strong westerlies eventually returned and ‘Banque Populaire’ passed Cape Horn on day 31, slicing 30 hours off the previous record time. On the journey the crew was rewarded with the company of an amazing selection of wildlife, including petrels, albatross, three whales and numerous flying squid and flying fish. However, dolphins rarely came to play as the boat was generally travelling faster than they can comfortably swim. There were also two natural wonders, the first was the huge B15J iceberg, part of a larger one that broke away from the Antarctic ice shelf a few years ago and was originally the size of Corsica. The second was at Christmas when they saw Lovejoy, the new comet that first appeared only a few weeks earlier – it lit the South Atlantic sky like a laser light from a nightclub. As a contrast the equivalent powerboat record, set by in 2008 by New Zealander Pete Bethune stands at 60 days 23 hours 49 minutes. 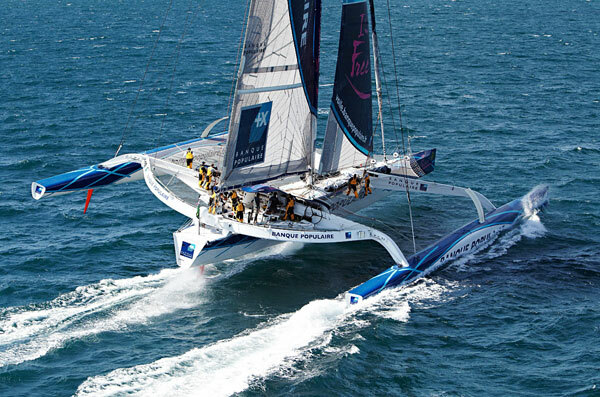 His 78ft wave piercing trimaran ‘Earth Race’ was powered by twin 540hp turbocharged and inter-cooled diesel engines.